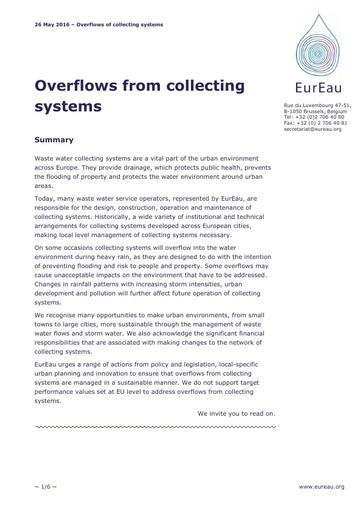 Waste water collecting systems are a vital part of the urban environment across Europe. We recognise many opportunities to make urban environments more sustainable through the management of waste water flows and storm water. 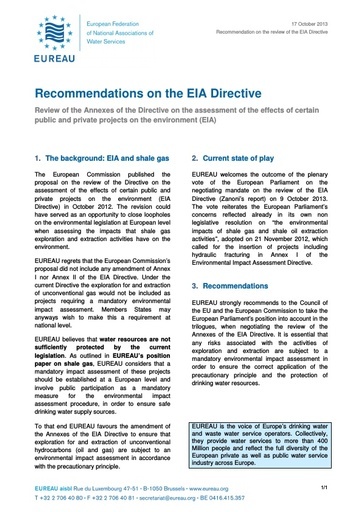 We need better coordination with other EU legislation to protect health, the environment and consumers from additional costs. 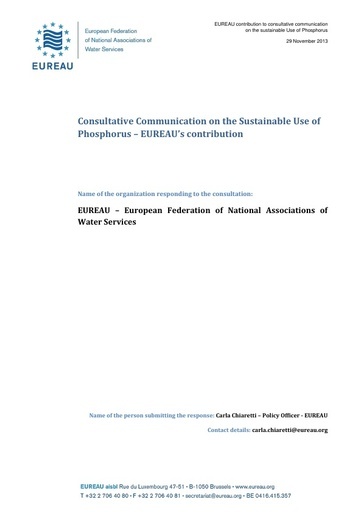 EurEau members are fully committed to public transparency. This empowers customers and stakeholders to improve their awareness of water matters and express their interest, ideas and expectations. 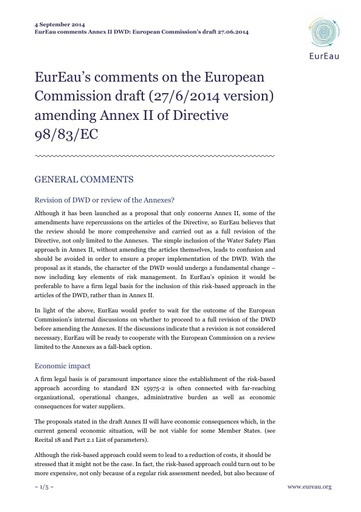 EU legislation must ensure protection of drinking water resources and safe and healthy drinking water for European citizens. 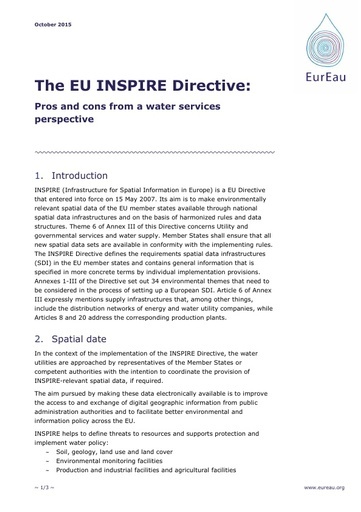 INSPIRE must provide relevant data about the soil, and groundwater and surface water quality. Pharmaceuticals can end up in the water cycle. 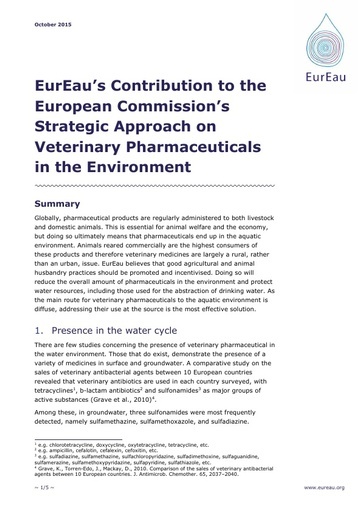 EurEau believes that good agricultural practices should be promoted and incentivised to reduce the amount of pharmaceuticals in the environment and protect water resources. We want to prevent contaminants from entering the water cycle in the first place. 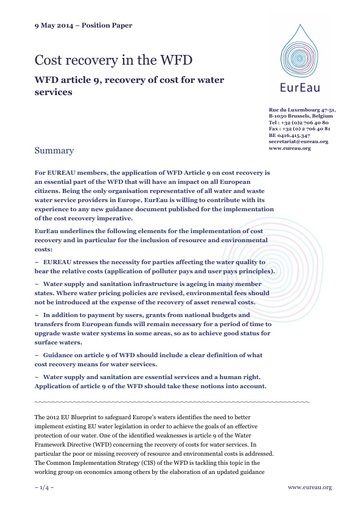 If this is not possible, EurEau insists on the proper implementation EU legislation so as to protect health, the environment and protect consumers from additional costs. 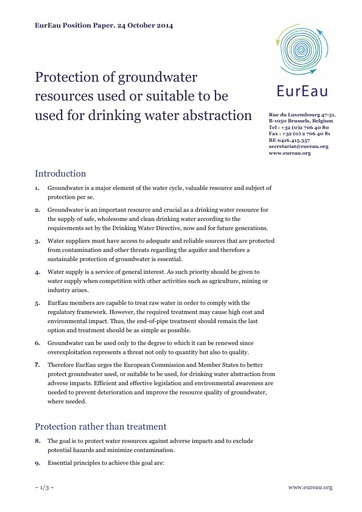 The Plant Protection Products Regulation, the Biocidal Products Regulation, and the REACH Regulation send the right signals regarding the hazard-based approach and the precautionary principles with regards to the protection of water resources. 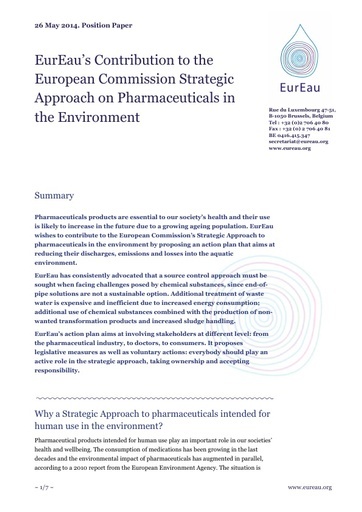 We need better coordination with other EU legislation to protect health, the environment and consumers from additional costs. Microplastics can enter the water cycle in many ways and are not entirely biodegradable. They can accumulate and could pose a threat to our water resources and ecosystems. 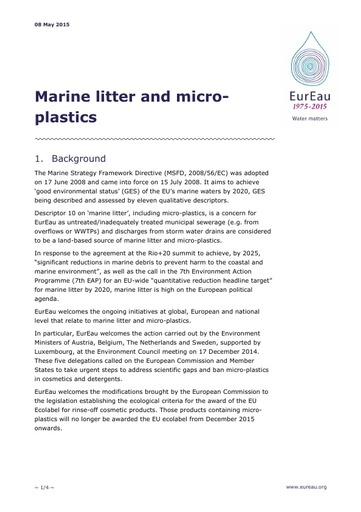 Control at source is essential for microplastics to prevent them from entering the environment. We need extended producer responsibility. 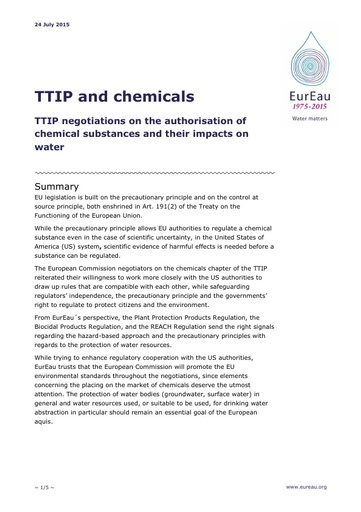 Additional treatment steps exist which will lead to increased tariffs for consumers. Increased treatment to provide consumers with clean water means increased consumer costs. Phosphorus is a scarce yet vital resource. 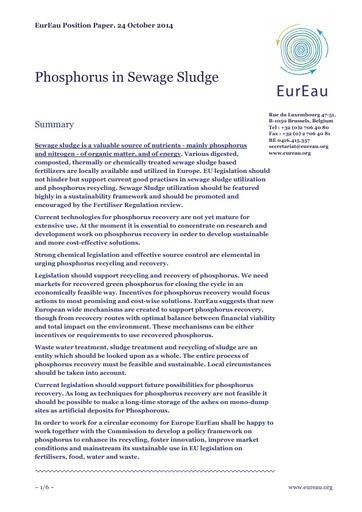 Recycling phosphorus from sewage sludge in fertiliser products promotes recycling and is better for the environment. Access to clean water is essential for our health. 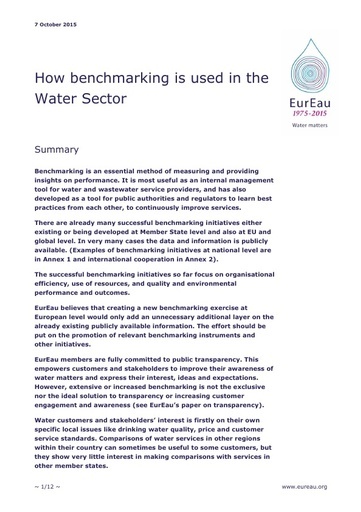 EurEau members provide consumers with water that meet some of the world’s strictest standards, every day. Pharmaceuticals products are essential to our society’s health and their use is likely to increase in the future due to a growing ageing population. 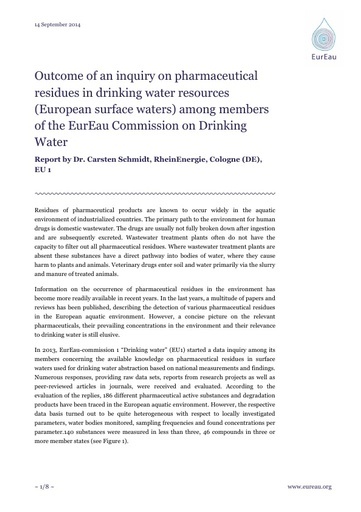 We want to prevent pharmaceuticals from entering the water cycle in the first place. 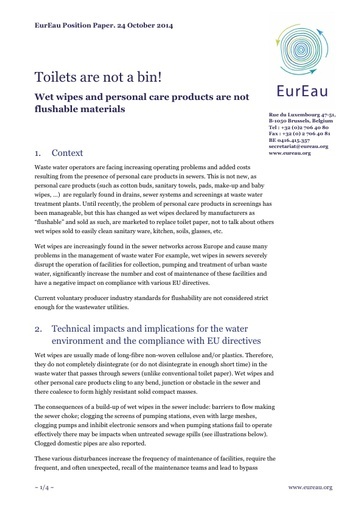 If this is not possible, EurEau insists on the proper implementation EU legislation so as to protect health, the environment and protect consumers from additional costs. WSPs help ensure safe drinking water for all. 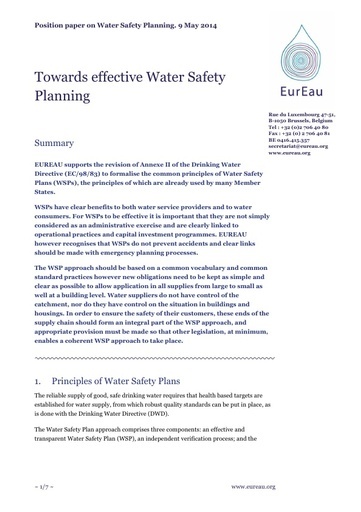 Customers and citizens need a much greater understanding of the value of water, including water pricing policies and the governance of water services, namely which players are involved, who takes the decisions on how water services are managed and who is responsible for what. Achieving this will help ensure access to safe and sustainable water today and tomorrow. 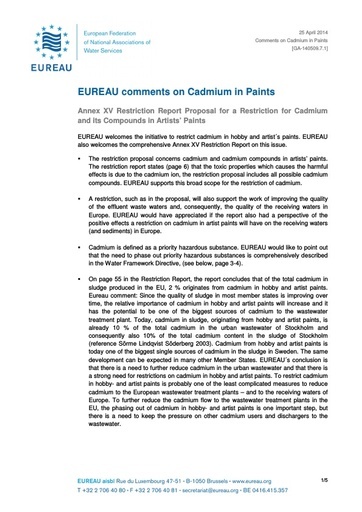 Cadmium in residual products from waste water treatment plants reduces their ability to be recycled and reused. By banning the use of cadmium in paints and other products, we open the doors to better recycling and better environments. Water is life. 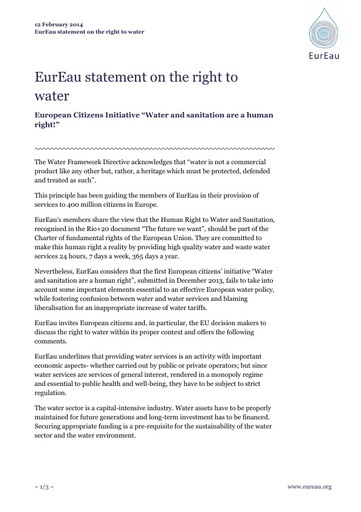 EurEau members provide consumers with water that meet some of the world’s strictest standards, every day. Pricing policies and affordability mechanisms play a fundamental role in this. 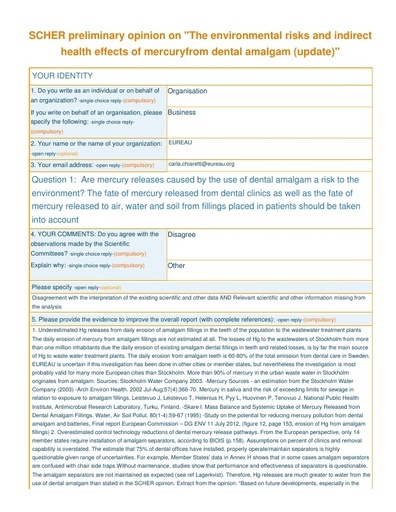 Banning mercury will help sludge from waste water treatment meet the quality standards to be reused in fertilisers, improving the environment. 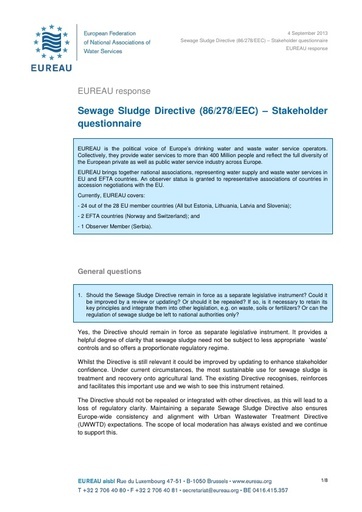 Recycling sewage sludge in fertiliser products promotes recycling and is better for the environment.